The black and white butterfly graphic design used above and throughout the MyPCMyWay™ site(s) is from a template designed by http://www.metamorphozis.com and is copyrighted to them...why not visit their site and get your own website template! THIS PERSON IS NOT AFFILIATED WITH MyPCMyWay.com or it's 5 other websites OR with MyPCMyWay™ THE BUSINESS. THIS WEBSITE IS OWNED/OPERATED AND IS REGISTERED IN THE STATE OF TEXAS BY DANIEL & LITA LETOURNEAU AND THEY FULLY INTEND TO TRADEMARK THIS COMPANY NAME AND LOGOS IN THE NEAR FUTURE! 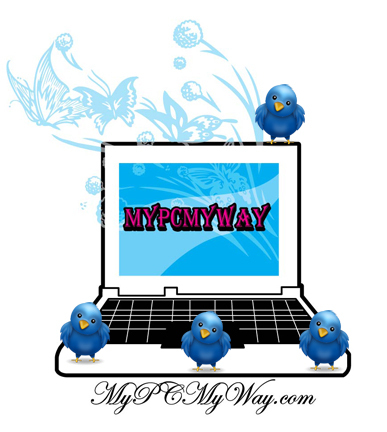 IF YOU ARE DOING BUSINESS IN CALIFORNIA WITH THE PERSON MENTIONED ABOVE, YOU ARE HEREBY NOTIFIED HE DOES NOT REPRESENT THE REAL MyPCMyWay™ or MyPCMyWay.com AND WE WILL NOT BE HELD LIABLE FOR ANY CLAIMS MADE BY ANYONE OTHER THAN US! PLEASE BE WARY OF BUSINESSES AND ALWAYS VISIT A SITE TO ASCERTAIN THE TRUE OWNERS BEFORE DOING BUSINESS WITH SOMEONE BASED ON A WEBSITE! The purpose of our Family of websites is to build the largest Online Community of computer users. Our goal is to enable users to find solutions to their computing issues. This includes hardware/software choices for their systems as well as finding workable solutions to problems. One way to get more from your system is in the exploration of alternative Operating Systems. This site will focus on showing users that Linux is a viable choice as their Operating System. This can be done as a standalone system or as a dual-boot with existing Windows® platforms or other Linux Distributions. Dan and I have been using PC's since the early 90's when we bought our first IBM clone computer. It only used floppies and didn't have a hard drive. I have been building desktop systems for my family and friends since 1997. Dan worked for a major computer manufacturer from 1997 to 2009. We both hold Bachelor Degrees in Business from LSU-Shreveport and have served as members in the Computer Club of Austin. Because we have a large family and we all have our own computers, software purchases can become quite expensive. I started looking at Linux as an alternative OS about 5-7 years ago. It was confusing, at first, but now I move throughout my Linux desktop with ease and comfort. I LOVE the customization flexibility I have with my OpenSUSE system. There are few visible differences in it and my Windows XP® or the Vista® system we were just forced to purchase (yes, I said forced--we recently purchased two laptops to start this business and BOTH only came with Vista Home Basic® pre-installed on them and ONLY a RESTORE partition--no "REAL" disk in case of software problems). I immediately tried to shrink the Vista® partition and was only allowed about 30GB out of 160! So, I installed Kubuntu 8.10 alongside the Vista® and now that system is dual-boot. The second laptop got an entire software makeover. I wiped the Vista® and purchased a copy of XP® from our local Fry's. I then had the choice of how much of the 160GB hard drive to allot to Windows® and how much to allot to my OpenSUSE 11.1! For me, OpenSUSE is the most user-friendly flavor of Linux...I LOVE the control it gives me over MY Operating System Environment! As a LONG time Windows® user, I believe OpenSuse is the most user friendly choice when trying Linux. I started out using Red Hat, switched to SuSe (retail version) and have used Kubuntu. My personal favorite is OpenSuse (no retail version & only online support). You can purchase the retail version of SuSe from Novell and it will entitle you to limited support (usually 90 days). I switched to OpenSuse because I didn't need the "limited" support that came with the retail version and I didn't want a book with each version. I upgrade yearly as the distribution is upgraded. We will place links to download the most current versions of either OpenSUSE or Kubuntu...why not download a version and see for yourself that Linux is the Best Option for a stable, customizable, "FREE" operating system. Linux works fine next to a Windows® system or Fantastic all by itself. While the main focus of this site is to show users the benefits of using "Open Source" software, we will also try to offer software/tips that are useful if your Choice of Operating Systems is Windows®. We still use Windows® in our homes and realize that some users just are NOT ready to try Linux. Our systems are either Dual-Boot (meaning we use TWO Operating Systems) or Linux only! Depending on what YOU use your computer for, you might be a great candidate for Linux too! One benefit I have realized in having a dual-boot system is that if the Windows®is not accessible, I have still been able to use my computer by booting into the Linux operating system. (this will depend on the REASON you can't access one of your operating systems)...I have used Linux on numerous occasions to access my Windows® partition! Our business will focus on building a network of computer users who can share their computing experiences and form an alliance to impact the future of computer software and hardware options. We believe by joining together, we can gain a collective voice to effect Hardware and Software support policies (ie. programs and drivers). We hope to drive the market to support separation of these entities. Together, we can stop the process that forces consumers to upgrade hardware to support newer software and software companies working with hardware manufacturers to insure "their" "proprietary" software is the only "real" choice buyers get. If you are not aware that there is a system of writing software to support newer hardware and designing new hardware to support new software, check out the following link! "New Hard Drives May Force XP Users to Upgrade to 7"